Winter is hanging on here in the north, (it just snowed AGAIN yesterday!) so another comfort food recipe is required on this Monday. Even though this is good comfort food, it's also loaded with broccoli, carrots and whatever other vegetables you want to add. Stir fry recipes are so great that way - just use what you have! I love the savory/spicy flavor of this sauce, and the steak makes it extra special. 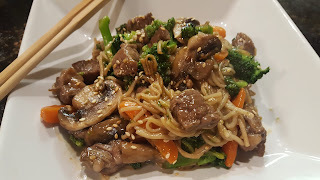 I did not have udon noodles when I made this and substituted rice noodles, as you can see in the picture. Udon noodles are those "heavier" wheat-y noodles, and would typically fit this kind of dish much better. But again, I'm a "use what you have" girl, so rice noodles it was. 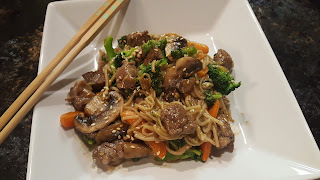 In any case, you could easily sub cooked linguine or something that makes it easy for you - you'll get similar results, and it's really the veggies and sauce that shine in this creation. Pour in the soy sauce, vinegar, brown sugar, ginger, and chili garlic sauce. Whisk the ingredients together, cooking until the sugar has melted. Combine cornstarch with 2 Tbsp. water and whisk to dissolve. Heat 1 Tbsp. oil in a large wok or skillet over medium- high heat. Add the steak to the the hot pan, and cook 3-5 minutes, working in batches as necessary, then set aside. In the same pan, heat another tablespoon of oil. Add the mushrooms and broccoli and carrots, and cook and stir for 3-4 minutes or until crisp tender. Add the noodles and lightly fry for about 2 minutes.